The Jordan Valley is the Palestinian area most relentlessly exploited by settlement agricultural companies. Most famously campaigners have been focusing on the Israeli national exporter Carmel Agrexco for their illegal exports from the area. However, Corporate Watch has uncovered a new company to add to the target list. During a trip to the area we found a packing house bearing the signage of the Israeli company ‘Edom UK’ (http://www.edom.co.il/), 20% owned by the British company Valley Grown Salads (www.v-g-s.co.uk). 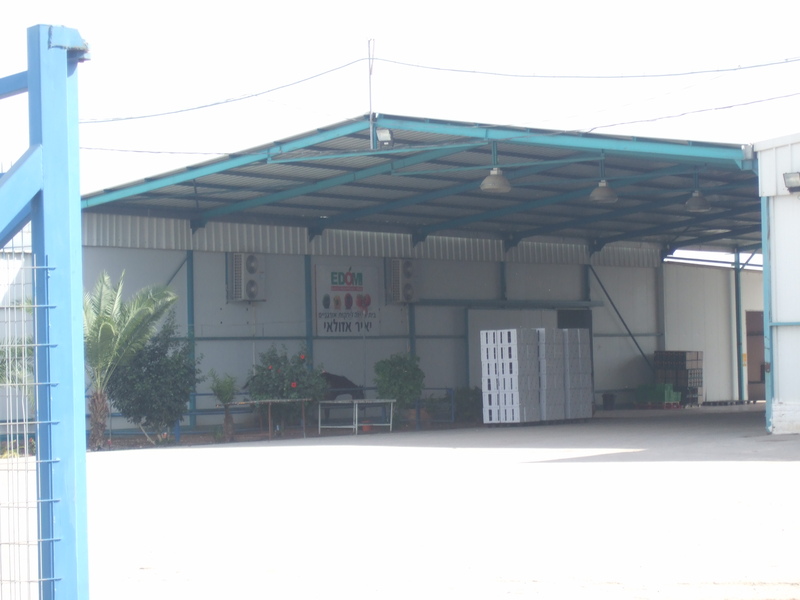 The packing house is based in the agricultural area of the settlement of Tomer. 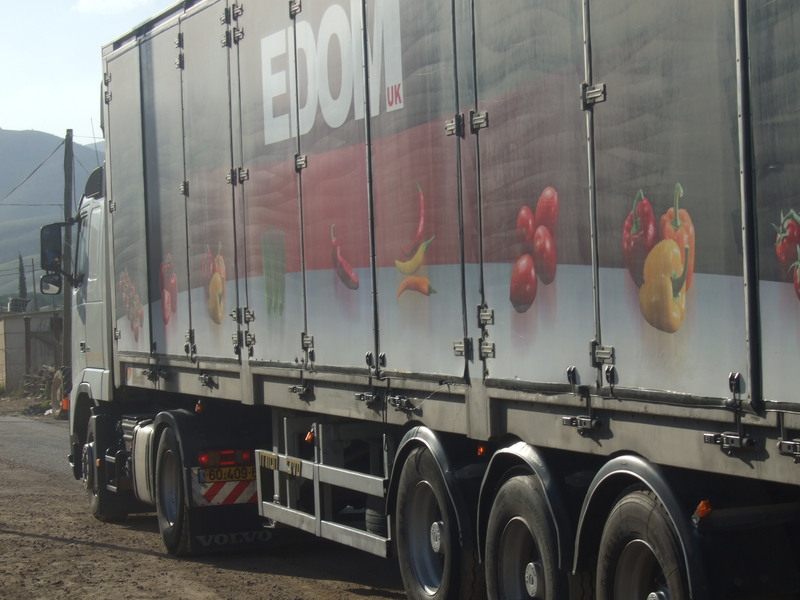 There was also a truck marked EDOM UK picking up produce from the settlement. Edom was founded in 2003 and is described by Valley Grown Salads as ‘a partnership between a select group of growers, marketers and customers’, of which they are a part. Jimmy Russo, Valley Grown Salads’ owner and director, is also the chairman of Edom. In 2008, a sister company, EDOM Fruit, was established. Not only does Edom directly profit from the occupation by operating in the Jordan Valley – we also found immediate evidence of worker exploitation tied to their business when we talked to Palestinians in the area. According to two men working in the fields opposite Tomer, pickers working in the fields supplying Edom’s packing house get paid 60 Shekels a day -less than half the current Israeli minimum wage (which Palestinians are legally entitled to) and work on a day to day basis without contracts. The men also confirmed that children as young as 13 work with them in the fields where they pick tomatoes, cherry tomatoes, cucumbers and aubergines: all produce advertised by Valley Grown Salads through their UK web-site. Valley Grown Salads supply two British supermarket (they don’t say which ones). 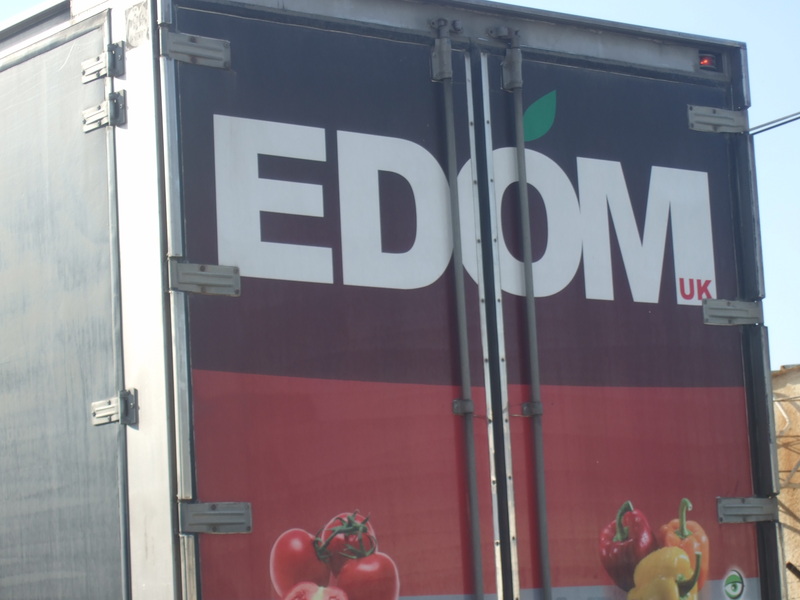 Workers in Tomer informed us that the products packaged at Edom are exported to Europe, with confirmed destinations being the UK and France. Unsurprisingly, VGS’s operations in the Jordan Valley are nowhere to be found on their official web-site, where they promote themselves as a caring company with an interest in community relations. Under the heading ‘Working together for the community’ you can read all about their ‘joint project’ with Edom in the Arava desert, on the Israeli side of the Green line, where they sponsor a plot of land close to the local school so that its children can ‘learn about food’, as well as a room where ‘they study and learn how to care for the environment and wildlife’. This is a far cry from the reality for the children of Fasayil, and other Palestinian communities around the Tomer settlement, who do not appear to figure in EDOM’s CSR rhetoric. Communities in the valley are prevented from building homes, hospitals, schools or any other building by the Israeli military and Israel’s stranglehold on the local economy forces people to work in the settlements. With regard to the supermarkets Valley Grown Salads supply, I can confirm one of them is Waitrose.